LOVE! your mounts look great with the pastels, and this piece is well balanced...the eyes move around the work nicely and then start detailed focus...Your colors are really popping! I love the fish.. that is a great place to park the eyes and ponder the entire work...GO GIRL! love this pastel. wonderfully fluid, colors great, excellent composition and an aura of mystery. Amazing colors! A dynamic composition!!! a change in consciousness attributable to outside influences. in this case, the female figure who finds herself acted upon and influenced by outside forces - some of whom are literally attached to her [the bird, the head, the fish] perhaps it would be "a mysterious intervention". What she gets in her eyes? Make me think to my little blind sister; nice concept. Outside the edge for sure! Good luck on your show. You have got your own style that is very easy to identify. You will do well. I admire your great work ! Hello jennifer, this is the first time I have seen your art - this piece stood out on your page for me. I love how it all flows together, there are so many nice overlapping shapes and the color is wonderful, vibrant and complementary. I like your other pieces too but I hope you will continue to experiment with pastels. A fav. thought provoking emotional work my friend! Well, well, well, Jennifer... Your pieces are so introspective and provoking... I love your explanation of this one. I "see" that the "seeing" here is so instrumental with the hormones of the human figures. Perhaps you are able to "see" and create and the rest of us can imagine what you are "seeing". Nonetheless, I feel there is a strong fertility thing going on here - watching and connecting and being so powerful. Love it and love you. Always enjoy your work Jennifer. And I can see you enjoy doing your work as well. I know just how she feels...any of the shes. Immagine che scivola lungo la circonferenza della sfera del sogno...Ottimo!!! Muito original este excelente trabalho!!! Um abraço. Excellent work of art :-)) Stunning comp and beautiful colors! 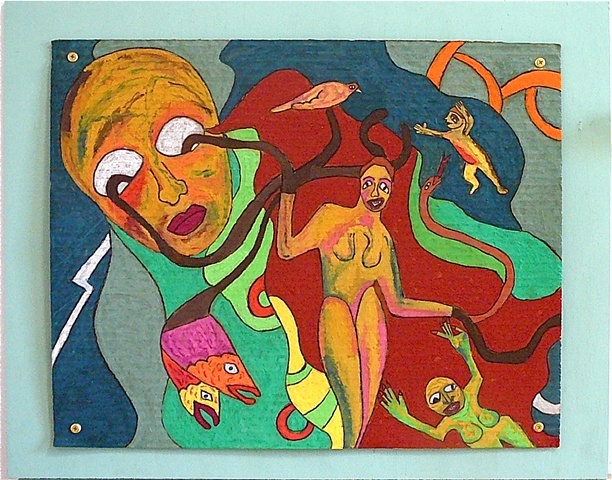 Great work Jennifer, here I see a young woman who is deeply rooted in her parent figure and then you see other roots spreading out from her into the creatures of the sea, birds of the air and animals of the land, also a concern for the environment and the universe and mostly life. a rich composition, full of ideas, very suggestive artwork ! A fabulous piece of artwork Jennifer and so beautifully presented! Marvelous colour composition on this painting and wonderful creativity too, very well done! Fabulous colours on this painting Jennifer, amazing use of rich pastels!